Over the past month I’ve been working intensely on a live score for Bukit Brown Cemetery. I will be presenting this on Friday 20th November 2015 at CAKE THEATRE’s event Running With Strippers. It’s been an inspiring process and I’m very grateful to Natalie Hennedige, Sharon Tang and the rest of the CAKE team for helping to make this work possible! Since the end of last year I’ve been working with Charles Lim on the sound for one of his SEASTATE pieces – It’s been a rigorous process and a valuable learning experience! Charles is presenting his work at the Singapore Pavilion in Venice’s Arsenale. The pavilion is curated by Shabbir Hussain Mustafa of the National Gallery Singapore and commissioned by the National Arts Council, Singapore. Catch it from 9 May to 22 November 2015. I have been invited by HCF and Associates to create a multichannel soundscape installation for FUGUE 1,3,5,7 – their half of this years Archifest Pavilion, Singapore. 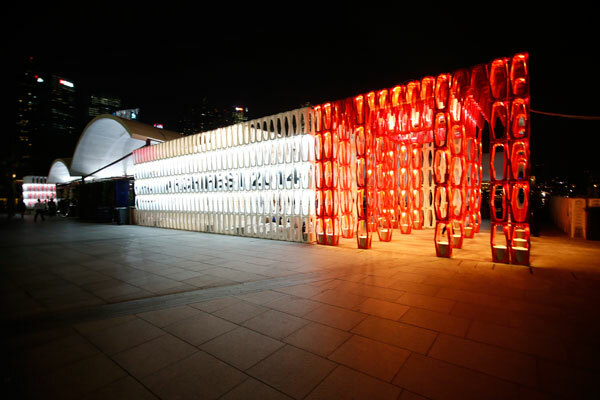 The festival takes place 26 September 2014 to 11 October 2014 and is organised by the Singapore Institute of Architects (SIA). How do we talk to each-other when our communication is mediated by language and technology across time and space? In this exhibition twenty-two established and up-and-coming artists from the United Kingdom and Singapore address this theme with diverse and exhilarating responses. In her haunting film Fragments on Machines Emma Charles observes the evolution of New York’s architecture to accommodate the matconnectors that comprise the physical manifestation of the “virtual” world. Natalie Dawkins uses humour in works exploring the ways in which we control – and are controlled by – social media. Min-Wei Ting’s elegiac work You’re Dead To Me communes with the tropical forests and ancient tombs of Singapore’s Bukit Brown cemetery, a location further explored in Zai Tang and Simon Ball’s animated soundscape composition Exploit (Bukit Brown Cemetery II). On the evening of Saturday June 14th at the gallery will also host ‘Broken Telephone’, a celebration of contemporary Singaporean and British writing and poetry presented by Singapore writer and artist TaniaDe Rozario, with invited guest writers. Ghost of the Wire= is an immersive and richly textured show which asks us to think again about our public and private modes of communication in the modern age. I have devised a series of sound-based workshops for the elderly that will take place at Pasir Ris-Elias CC, Singapore in May. Really looking forward to helping the participants discover sound and listening through a variety of means! The artwork is at its most contemporary within the studio, always a moment too late after. I will be taking part in Superposition(s), a curatorial project of overlapping encounters: between curators and artists, designers and image-makers; between practitioners and audience; between the imagined publics of curators and artists. It aims to chart the processual relationships between these encounters, tracing the spaces between collaboration and resistance. For the duration of the exhibition, artists share and convert the space of the exhibition into their own studio spaces. The audience is encouraged to observe and engage with the artists, experiencing not the artworks themselves but rather the different processes of each artist’s practice. At the same time, curators and writers contribute texts as a response to the artists and their process of developing a work, and to also frame the way audience members encounter the entire space of the exhibition. As part of the final event of Urban Lab Films DEMOLITION season, ‘Dream and Destruction’, Simon Ball and I will be screening our latest collaboration, Flickering Shard (2014). The programme also includes Demolishing and Building up the Star Theatre (1901) by Frederick S. Armitage, the Lumiere Brothers’ Demolition d’un Mur (1896), Nathan Eddy’s The Absent Column (2013), Dan Edelstyn’s Breaking It Big in Burnley (2013) and an episode of the Channel 4 series Demolition (2005). Come join us 7pm on Thursday 20th March at the White Building in Hackney Wick – entry is free. Looking forward to being part of this show! I’ll be performing on he opening night, 6th Feb 2014 @ 6.30 pm, along with Riduan.